This is a hardcopy paintmaster of the Luke Skywalker in Stormtrooper Disguise action figure. It's fully painted using the same color scheme as is found on the production figure. If just a hardcopy of such a popular action figure isn't enough, it also has a set of paint swatches. 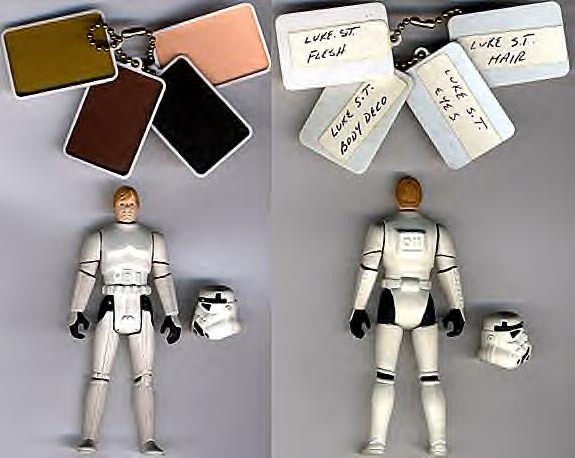 These swatches show the colors used on various parts of the figure to a vendor, ensuring that the right colors are used in the final production process. Here's a shot of the piece in a disassembled state. As is true of most hardcopies, the limbs of the figure are attached to the torso with metal pins, and can be removed with ease. You can see that it is made of the typical green dynacast used with many hardcopies. 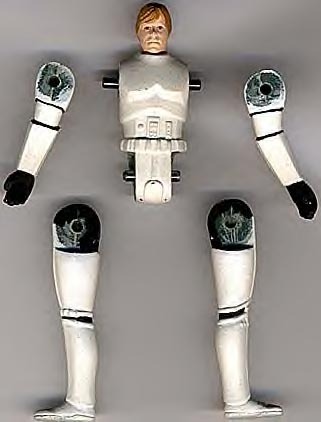 In this close up photo, you can see that this hardcopy has an alternate sculpt for the head when comparing it with a production Luke Stormtrooper. Thanks to 12back.com for the image of the loose production example.